1. Are there any standards or requirements for portable hand wash stations that will be used in a school, daycare or nursery setting? For many school, daycare, nursery, and child care center settings, having all equipment above the minimum safety and code requirements is a big consideration. The NSF or National Science Foundation is a United States government-managed agency that tests equipment for use in a variety of specialized settings. A portable hand wash station that meets NSF standards means that the product has been reviewed and passed all required safety standards for use of the sink. This not only provides liability protection for the school, daycare or nursery but it also gives staff and parents peace of mind to know that their children will be safe using the provided equipment. 2. What are the most important features to consider in selecting a portable hand wash station for a daycare environment? There are many different features that can be found on a portable hand wash station for any type of child-centered environment. 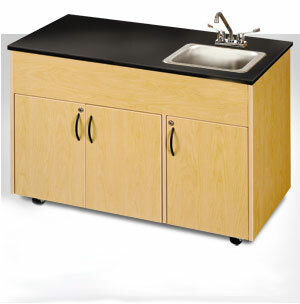 One of the most important features for any portable sink is the height of the cabinet and sink. 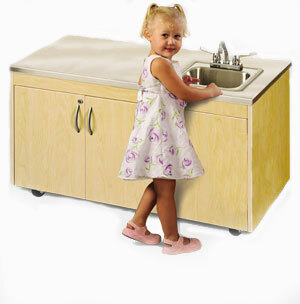 Models that are designed with kids in mind will typically have countertops at about 28 inches in height. Companies may also offer a non-skid, slip resistant step that can be used for toddlers and kids under the age of three. 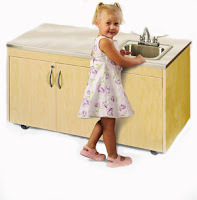 This allows the children to learn how to wash their hands without needing an adult to give them a boost up to the sink. Faucets that work on a sensor are also a great way to encourage kids to use the sink. It also eliminates a lot of clean up when little hands work the taps. Another great feature that make filling up fresh water containers a snap is an adaptor hose that fits on the fresh water tap and connects to the top of the container. This job can be made even easier with a dolly system that allows you to roll up to the sink with the tank, eliminating the need to lift or carry the heavier full tanks. 3. I like the idea of a laminate top for my classroom portable hand wash station. Is this a good idea? What are the benefits? 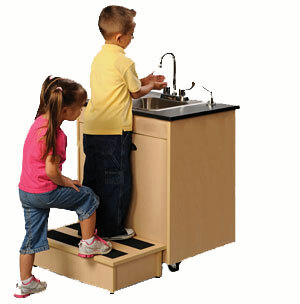 Laminate is a great idea for a school, daycare or nursery portable hand wash station. It is easy to clean, resists stains and scratching and also can be coordinated to match colors or existing countertops or work surface areas. It is important to check the laminate and ensure that it is melamine that is made without phthalates or lead. Laminate tops require minimal in the way of routine care. In any type of setting it is a good idea to use an antiviral cleaner that can reduce the chance of contamination or the spread of germs with multiple users. A good option for this type of cleaning solution is Steramine. It kills viruses and is very easy to mix and use and doesn't have the harsh smell of chlorine or ammonia based cleaning products.